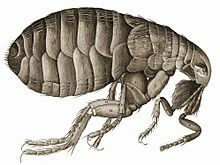 Fleas are wingless insects, 1/16 to 1/8-inch (1.5 to 3.3 mm) long, that are agile, usually dark colored (for example, the reddish-brown of the cat flea), with tube-like mouth parts adapted to feeding on the blood of their hosts. They interestingly do not possess a mandible. Their legs are long, the hind pair well adapted for jumping; a flea can jump vertically up to 7 in (18 cm) and horizontally up to 13 in (33 cm), making the flea one of the best jumpers of all known animals (relative to body size), second only to the froghopper. If humans had the jumping power of a flea, a 1.8-m (6-ft) person could make a jump 90 m (295 ft) long and 49 m (160 ft) high. Their legs end in strong claws that are designed to grasp a host. Atypical of other insects, fleas do not possess compound eyes but instead have simple eyes with a single biconvex lens. Their eyes are known as "eyespots". In some cases, there is no eyespot at all. Their bodies are laterally compressed, permitting easy movement through the hairs or feathers on the host's body (or in the case of humans, under clothing). The flea body is covered with hard plates called sclerites. These sclerites are covered with many hairs and short spines directed backward, which also assist its movements on the host. The tough body is able to withstand great pressure, likely an adaptation to survive attempts to eliminate them by mashing or scratching. Even hard squeezing between the fingers is normally insufficient to kill a flea. Flea larvae emerge from the eggs to feed on any available organic material such as dead insects, feces, conspecific eggs, and vegetable matter. In laboratory studies, some dietary diversity seems necessary for proper larval development. Blood-only diets allow only 12% of larvae to mature, whereas blood and yeast or dog chow diets allow almost all larvae to mature. Another study also showed that 90% of larvae matured into adults when the diet included nonviable eggs.They are blind and avoid sunlight, keeping to dark places such as sand, cracks and crevices, and bedding. Given an adequate supply of food, larvae pupate and weave silken cocoons within 1–2 weeks after three larval stages. After another week or two, the adult fleas are fully developed and ready to emerge. They may remain resting during this period until they receive a signal that a host is near - vibrations (including sound), heat, and carbon dioxide are all stimuli indicating the probable presence of a host. Fleas are known tooverwinter in the larval or pupal stages. Once the flea reaches adulthood, its primary goal is to find blood and then to reproduce. Its total life span can be as long as one and one-half years in ideal conditions. Female fleas can lay 5000 or more eggs over their life, allowing for phenomenal growth rates. Average 30–90 days. Newly emerged adult fleas live only about one week if a blood meal is not obtained. However, completely developed adult fleas can live for several months without eating, so long as they do not emerge from their puparia. Optimum temperatures for the flea's life cycle are 21 °C to 30 °C (70 °F to 85 °F) and optimum humidity is 70%. In the past, it was most commonly supposed that fleas had evolved from the flies (Diptera), based on similarities of the larvae. (Some authorities use the name Aphanipterabecause it is older, but names above family rank need not follow the ICZN rules of priority, so most taxonomists use the more familiar name). Genetic and morphological evidence indicates that they are descendants of the scorpion fly family Boreidae, which are also flightless; accordingly, they may eventually be reclassified as a suborder within the Mecoptera. Protozoa: Trypanosome protozoans such as those of the subgenus, use a variety of flea species opportunistically as vectors. The itching associated with flea bites can be treated with anti-itch creams, usually antihistamines or hydrocortisone.] Calamine lotion has been shown to be effective for itching. Flea and tick repellant powder being applied to a dog. Cedar oil, a nontoxic natural substance, has been proven effective in the eradication of infestations in pets. [dubious – discuss] However, use of some essential oils can be hazardous to cats, especially those containing phenols. Flea infestation in the home are treated in various ways. A spot-on insecticide kills the fleas on the pet and in turn the pet itself collects and mops up newly hatched fleas. A fogger or spray insecticide containing an insect growth regulator, such as pyriproxyfen or methoprene can kill eggs and pupae, which are quite resistant to insecticides. Frequent and thorough vacuuming is also helpful. The vacuum must be used around everything the animal frequents, to pick up all the larvae and eggs. Traditional advice recommends disposing of the bag after each vacuuming. One very limited experiment (only one vacuum sweeper used on a single type of carpeted surface) found that vacuuming killed 96% of adult fleas and 100% of younger fleas. This preliminary study's applicability to other circumstances is unclear. Diatomaceous earth can also be used as a home flea treatment in lieu of acetylcholinesterase inhibitory treatments or insecticides which carry with them a risk of poisoning for both humans and other animals. However, diatomaceous earth dust is harmful to pets and people when inhaled, requiring use of a dust mask to apply. Bathing dramatically reduces the flea population on a badly infested animal, especially when in combination with a mild detergent or shampoo, and brushing or combing. Fleas cannot withstand high temperatures, so a turn through the dryer on medium or high kills fleas on clothing. Fleas can be drowned by immersion for about 24 hours; they may appear to be dead if immersed for shorter times, but can revive after some hours. Soaps and surfactants can facilitate the death of fleas in bathing. The process of washing the flea (and the pet) removes integumental waxes on the flea's body and it dies from dehydration. Approximately $2.8 billion is spent annually on flea-related veterinarian bills and another $1.6 billion annually for flea treatment with pet groomers. Four billion dollars is spent annually for prescription flea treatment and $348 million for flea pest control. Besides just economic costs to control fleas as pests, fleas provide some ecosystem services (benefits from ecosystems that support human life and well-being). Flea larvae feed on organic debris and increase the surface area of particulate matter to assist in decomposition. Fleas affect human culture as well. Several examples of poems and other literature, music, and art have been created regarding fleas. Fleas were even once a source of entertainment as part of the flea circuses. These circuses featured fleas performing circus acts while attached to miniature carts. Fleas are seen as a bioterrorism weapon as they carry Y. pestis. The infected fleas feed on rodents which then infect the human population with the plague. It was reported that during World War II, the Japanese army dropped fleas infested with Y. pestis in China. The bubonic and septicaemic plague are the most probable form of the plague that would spread as a result of a bioterrorism attack that used fleas as a vector.